Enjoy a beautiful desert retreat in this 3 bedroom 3 full bathroom bi-level townhome with a private swimming pool and private hot-tub with waterfall and fountains. This secluded home is private, functional and ideally situated just steps to the newly renovated Convention Center, Downtown Palm Springs and the Palm Springs International Airport. This amazing vacation home has modern furnishings complete with luxurious Ralph Lauren linens throughout; all kitchen, dining and entertainment needs; plasma televisions/DVD in nearly every room. Large plasma/DVD with surround sound in the family room, with accessible to keyboard and mouse and full service printer/fax/copy/scan. Oversized master suite with walk-in closet, walk-in shower, double vanity and 32' plasma/dvd and ceiling fan. Jr. en suite with full bath, glass shower, plasma/dvd, ceiling fan and beautiful views-overlooking pool. Lower level guest bed and full bathroom, laundry room, two car garage. Outdoor oversized gas grill, dining for 6, sunbathing lounges, sun umbrellas, pool with tanning deck and hot-tub. 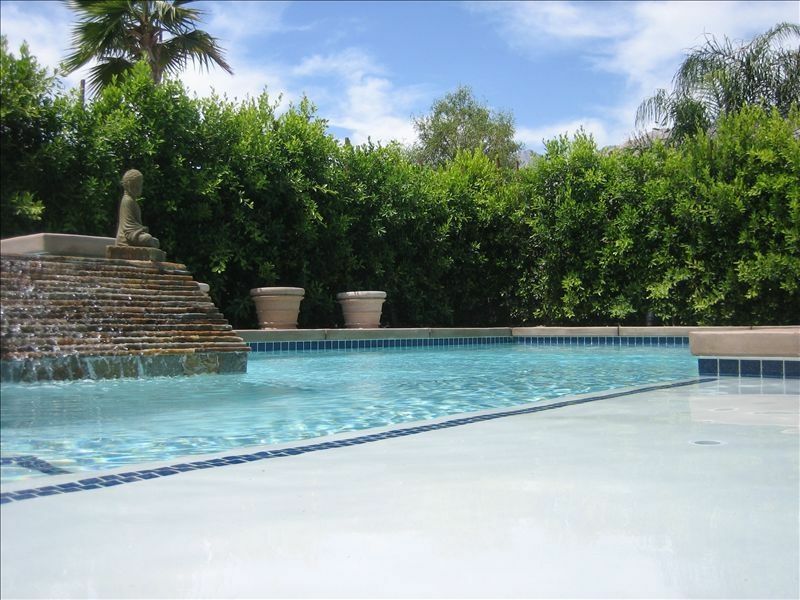 Located in a quiet gated community with two additional common area pools and spa's, putting green and park-like setting. Conveniently located to most anyone's needs or desires. Just a block to the newly upgraded Convention Center, we have huge interest to corporate guests. Three or four blocks to the Casino and Palm Canyon Drive with all the restaurants, shops, services, nightlife, weekly street fair and museums-walking, biking or driving could not be easier or more convenient. Several day trips are very accessible, the Outlet Mall and surrounding Casino's are always a hit. Golf enthusiasts only need travel a few blocks, the Aerial Tram, Living Desert, Palm Desert, Rancho Mirage and other great communities are all a short drive away. All bathrooms have 18' ceramic tile flooring. Guest bath has fully tiled walk-in shower with bench and glass doors, single sink vanity-main level. Guest en Suite on upper level has bathtub with shower, glass door enclosure and single sink vanity; located in guest suite. Master bathroom has oversized walk-in shower with bench, fully tiled floor to ceiling, over sized double sink granite vanity, floor to ceiling pantry, water closet; fully stocked. Front loading washing machine in home laundry room with pantry, detergents, ironing, etc. Towels provided for each bathroom. Oversized for you convenience. 6 overside/over plush Ralph Lauren + 6 striped or colored pool towels. (3) Full cable television with sport and movie packages-cable available in every room. Availability calendar not guaranteed to be accurate 100% of the time. We do not lease during major musical events; and retain the right to alter the security/damage deposit required-if required. Early or late check out by written agreement only. Late check out will result in a charge for not less than one half day fee-WITH NOTICE. Previously approved arrival or departure times ONLY.